Hundreds of leftists protest at government compound in Tel Aviv against wave of price increases, hold signs condemning PM Netanyahu. 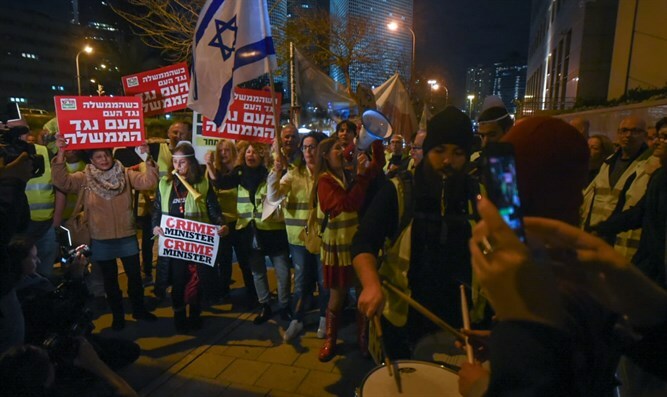 Hundreds of left-wing operatives are demonstrating tonight at the Azrieli junction in Tel Aviv, dressed in yellow vests and holding signs denouncing Prime Minister Binyamin Netanyahu. The protest is being held about the economy, but demonstrators are chanting slogans against the rightist government and its leader, holding signs reading "Crime Minister" and "When the government is against the people, the people are against the government." Some of the signs bear the symbol of the Arab Hadash party. The police said: "We are prepared for protest and we will work to ensure the safety, security, and well-being of the participants and, no less important, ensure that the protest does not harm the routine of the general public." They added: "The police will not prevent the protest from taking place in order to allow the freedom of expression and protest of any citizen who desires it, but we will not allow any disturbance of order and will act resolutely against violent incidents of any kind."